Skiing in Wrangell - St. Elias National Park, Alaska. A backcountry skier stands above the Kuskulana River, near Mt. Blackburn. 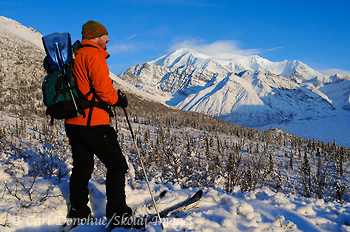 Cross country skiing in Wrangell - St. Elias National Park and Preserve, winter, Alaska. Please click on the image above to view a larger version of this photo. A quick photo from Wrangell – St. Elias National Park. By the way – if you want to see some great work – check out Jim Goldstein’s blog post, including links to over 160 photographers’ favorite photos from 2010. This entry was posted in Adventures, Alaska, Landscapes, News, Photography, Skiing, Winter, Wrangell - St. Elias National Park and tagged Mount Blackburn, Skiing, Winter, Wrangell - St. Elias National Park on January 13, 2011 by Carl D.
beautiful territory Carl! -40 cold! remembering my eyelashes frozen with crystals in 60 below wind chill! love your images! Thanks so much. Yes, minus 40 is something of a threshold, an achievement, I think. The cold becomes almost a ‘thing’ with its very own character. Pretty amazing experience.